When I was 14 years old, I dated seriously. I had a girlfriend and I thought I was going to marry her. In those innocent years, thoughts of sexual intimacy were not in my head. My emotions were clear and pure. Linda Sue was the girl I would marry. My fantasy came crashing down, however, when I travelled by subway from Mt. Vernon to the Bronx where she lived to surprise her. There I found her wooing another boy. I was speechless, devastated, and felt betrayed. Tears streamed down my cheeks as I made the lonely return trip to my home. In hindsight, I can only thank God for not answering my prayers about Linda Sue. Indeed, she was a sweet and pretty girl, but I was clueless about what real love is at that tender age. Moreover, my own identity was as yet unformed. I did not know who I was let alone knew who Linda Sue was. That fateful day, my illusions about love began to give way to reality and a wiser view of what lasting relationships are all about. 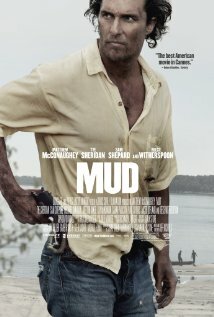 Mud on one level is a film about a criminal on the run. But on a deeper level, it is a wise film about coping with life once our illusions are shattered. The story opens as two teenage boys, Ellis and Neckbone, arrive at a small island in the Mississippi River. There they hope to acquire a boat stuck high in a tree, but they are frightened when they discover that someone is actually living in the boat. The occupant is Mud, a personable fellow who engages them in conversation, but who, in fact, is a fugitive on the run for murder. Mud wants to reunite with his girlfriend Juniper and then leave town as soon as possible. To accomplish this, he enlists the aid of the two boys, who convey messages from him to Juniper about Mud’s intentions to meet her. The boys do not reveal Mud’s hiding place either to parents or police. They like him and, therefore, they trust him. As this narrative is unfolding, there is a parallel plot involving Ellis and his parents, who are headed towards divorce. This is an unsettling reality that leaves Ellis emotionally confused. His house may be sold and his parents who once were in love are now out of love, something which Ellis cannot comprehend. Moreover, Ellis thinks he is in love with May Pearl, a high school girl several years older than him; and when she rejects his overtures in front of her friends, he is mortified. In the midst of his own psychological turmoil, he is enthralled with Mud’s passionate devotion to Juniper, which motivates him to facilitate their reunion, naively thinking that love will conquer all. Ellis steals machine parts and other junkyard supplies to help Mud repair the boat stuck in the trees so that Mud can escape his pursuers. Things, however, do not work out as planned and Ellis discovers that in the real world, one has to accommodate to the changing nature of human relationships. Separation and divorce may signal tragedy, but not necessarily the end of loving connections. Jewish tradition frowns upon marital separation and divorce. Marriage is considered a holy bond, and divorce has many negative connotations. The Talmud actually says “even God sheds tears when someone divorces his wife.” Sometimes, however, divorce is necessary for a variety of reasons. The aftermath of such a tragedy does not have to be negative. It can mean a new, more fulfilling destiny for many, and a second chance at a successful life. Both Mud and Ellis, each at vastly different points in life and facing very different challenges, finally understand that separation can ultimately be good and allow people to re-emerge from darkness into light. Posted in Action/Adventure, Crime, Drama. Bookmark the permalink. Good review. The movie is good, but its mainly the cast who allows this to work as well as it does, due to the fact that they have a pretty script on their hands here, and absolutely go-to-town with it.